Some readers might be grumbling to themselves right now. ANOTHER Spider-Man film? How many of these are we going to be subjected to before the filmmakers are finally able to get it right? Now that Phil Lord and Chris Miller (the minds behind The Lego Movie) are on board, you can take everything that you knew about the Spider-Man franchise and toss it out the window. This iteration of Spider-Man is notable for its ability to stitch together all of the past versions to create something that feels wholly new. Lord and Miller also allow the classic character to make a triumphant return to its comic book roots. Those who are familiar with their portrayal of Batman from the Lego franchise will know what to expect here. Spider-Man has been modified to the point where he has become a parody of himself. There are plenty of winks and knowing nods to the audience. While the tone can certainly be compared to the recent Deadpool films, Spider-Man’s newest installment comes with a family friendly PG rating. Marvel Studios has offered their blessing and the film was produced by Sony Animation Studios. Lord and Miller did not have the chance to actually direct this one but fans of their work will definitely notice their fingerprints. Bob Persichetti, Peter Ramsey, and Rodney Rothman have been tapped in their stead. This is a film that aims to break Spider-Man out of the usual formula that has bogged down so many other releases in the superhero niche. Some might get a kick out of the fact that Marvel is essentially pulling a reverse Disney here. Instead of turning animated classics into live action films, they have flipped the formula. Thanks to its main plot device (a rift has developed between universes), the film affords itself a sizable amount of latitude when it comes to the style and the characters that are used. The plot is fairly minimal and the film works as an origin story. We get to meet Miles, the boy who will one day replace Peter Parker (played by Chris Pine). All of this is merely a setup for the additional flourishes that Lord and Miller have done their best to add. There is even a “Noir Spider-Man” who is only seen in black and white (and played by Nicolas Cage). Some might find themselves wondering if the film is meant to be viewed as a straightforward comedy or if it is meant to be an action film. While movies like this one are not nearly as bizarre in the wake of Deadpool’s success, this is the sort of formula that is not going to work for every superhero movie. It works well as a stand alone film and you need no earlier knowledge of past Spider-Man installments (although it does help a bit). If canon and continuity are meaningful considerations, the viewer will remain satisfied. This fresh take on Spider-Man will have all audiences laughing and be sure to stay put after the end credits (this is a Marvel property, after all). This film aims to recapture the same feel that drew so many readers to the original Philip Reeve novel. The filmmakers have done a fantastic job of building a whole new world for the characters to explore and many of the common adaptation mistakes are avoided. While soft science fiction can tend to struggle to become believable in some instances, the Mortal Engines universe feels entirely self contained. This is a testament to the writing work of Peter Jackson, Fran Walsh and Philippa Boyens. Of course, these writers are certainly no stranger to franchise building and this is the clear aim of Mortal Engines’ story. The single story arc has been sacrificed, in hopes of creating a tale that can be told over the course of several installments. Since the book series comes as a four book set, it is easy to see why the filmmakers had such grandiose ambitions. As for the movie itself, it is set roughly 1,000 years into the future. A war has changed the world as we know it and larger cities have become sentient, spending their days looking for smaller settlements to munch on. The film even begins with a gripping sequence that immediately sets the table for what is about to take place. London is depicted as the king of these cities and the settlement of Salzhaken is being chased. A Salzhaken refugee attempts to assassinate the Guild of Historians’ leader soon after. Thaddeus Valentine (Hugo Weaving) is saved when his apprentice Tom Natsworthy (Robert Sheehan) puts a stop to the attack. Hester (Hera Hilmar) is the young woman responsible for the attack and when she and Tom are ejected into the Great Hunting Ground after the Salzhaken battle, they face a number of challenge. Of course, the two will learn how to trust one another along the way and put their differences to the side once and for all. Anna Fang, an Anti-Traction League agent, comes into the fray and assists the duo during their journey. There is a definite Star Wars influence to the story that many viewers will notice but it is a flavoring that does not overwhelm the main course. Fans of steampunk stories will be sure to enjoy this one, even if the lack of interest in YA adaptations is likely to keep the film from receiving the sequel its makers were so clearly shooting for. The other actors lend the proper level of depth to the material but Hugo Weaving’s performance is a true standout. Valentine might be a villain but Weaving gives the character the charisma that he needs in order to hold the viewer’s attention throughout the running time. It is not every day that our favorite books receive the splashy big screen treatment. Mortal Engines is not here to reinvent the wheel or change your idea of what a movie like this one is supposed to look like. However, it is a great way to spend a couple of hours and should appeal to fans of all ages…especially those who are into soft science fiction. 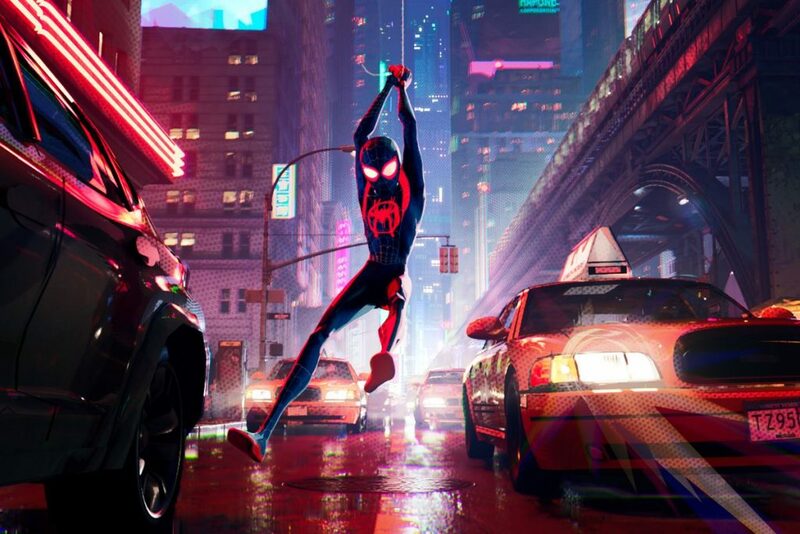 A joyful, trippy new incarnation of Spider-Man that you didn’t know you needed, brimming with wit, soul and jaw-dropping visuals. There’s never been anything like this animated exaltation of the Spider-Man canon. The animation is glorious, and more faithful to its comic-book roots than any big-screen graphics in the past. The story is deliciously witty and preposterously complex, but perfectly comprehensible, whether or not you have studied quantum physics. The scale feels vast, yet the spirit is joyous. It’s as if everyone had set out to make the best Spider-Man movie ever, which is exactly what they’ve done.